Please give serious consideration to donating to the Church by Bankers Standing Order Mandate or by numbered envelopes. Numbered envelopes can be used by everyone, including children and non-tax payers. All taxpayers can help improve the Parish income without donating any extra by completing a Gift Aid Declaration Form. Help us to take advantage of this opportunity given to us by our government. 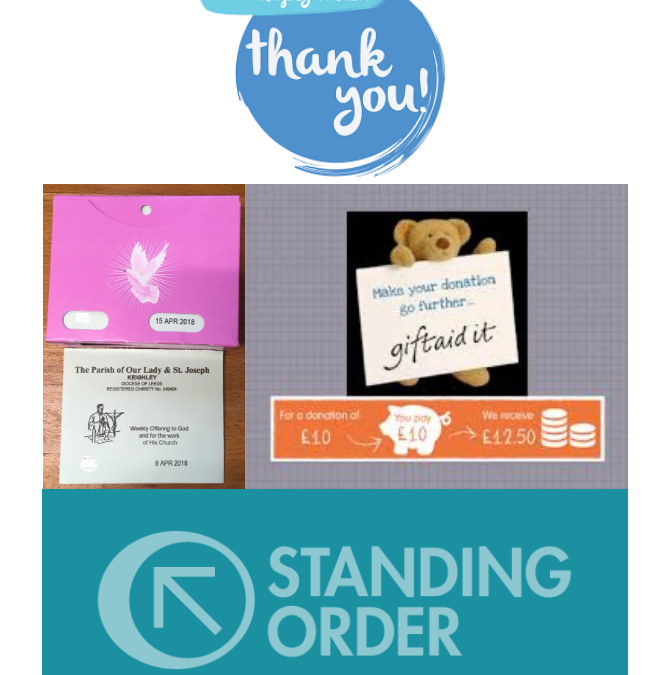 Thank you to those of you who have responded to the Appeal by increasing your donation, setting up payment by Standing Order and/or registering to contribute using numbered envelopes. This is greatly appreciated. Please remember the Parish in your will. For more information or to advise that you’ve taken a box of envelopes recently, please see or contact Jason Davies, Sheila Forde, Tony Nolan or Eddie Kelly.